African rose-ringed parakeet (P. k. krameri): western Africa in Guinea, Senegal, and southern Mauritania, east to western Uganda and southern Sudan, north to Egypt. Resident along the Nile valley and certainly Giza, it is sometimes seen on the north coast and in Sinai. The African parakeet also started to breed in Israel in the 1980s and is considered an invasive species. 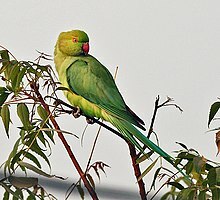 Indian rose-ringed parakeet (P. k. manillensis) originates from the southern Indian subcontinent and has feral and naturalized populations worldwide. In Australia, Great Britain (mainly around London), the United States, and other western countries, it is often referred to as the Indian ringneck parrot. Boreal rose-ringed parakeet (P. k. borealis) is distributed in Bangladesh, Pakistan, northern India and Nepal to central Burma; introduced populations are found worldwide. The Indian subspecies are both larger than the African subspecies. The genus name Psittacula is a diminutive of Latin psittacus, "parrot", and the specific krameri commemorates the Austrian naturalist Wilhelm Heinrich Kramer. Since the 19th Century, the rose-ringed parakeet has successfully colonised many other countries see Feral Birds section below. It breeds further north than any other parrot species. It has most successful been introduced to south east England specifically London, and less successful in the southern states of the USA. In the wild, rose-ringed parakeets usually feed on buds, fruits, vegetables, nuts, berries, and seeds. Wild flocks also fly several miles to forage in farmlands and orchards, causing extensive damage. In India, they feed on cereal grains, and during winter also on pigeon peas. In Egypt during the spring, they feed on mulberry and in summer they feed on dates and nest inside palm trees and eat from sunflower and corn fields. In captivity, rose-ringed parakeets will take a large variety of food and can be fed on a number of fruits, vegetables, pellets, seeds, and even small amounts of cooked meat for protein. Oils, salts, chocolate, alcohol, and other preservatives should be avoided. In north-west India, Indian rose-ringed parakeets form pairs from September to December. They do not have life mates and often breed with another partner during the following breeding season. During this cold season, they select and defend nest sites, thus avoiding competition for sites with other birds. Feeding on winter pea crops provides the female with nutrients necessary for egg production. From April to June, they care for their young. Fledglings are ready to leave the nest before monsoon. A blue colour morph mutation parakeet kept as a pet. Rose-ringed parakeets are popular as pets and they have a long history in aviculture. The ancient Greeks kept the Indian subspecies P. krameri manillensis, and the ancient Romans kept the African subspecies P. krameri krameri. Colour mutations of the Indian rose-ringed parakeet subspecies have become widely available in recent years. A blue colour morph mutation of the rose ringed parakeet is also commonly kept in aviculture. Birds that display this mutation have solid light blue feathers instead of green, and lack the rings of their normal counterparts. Both males and females have the ability to mimic human speech. First, the bird listens to its surroundings, and then it copies the voice of the human speaker. Some people hand-raise rose-ringed parakeet chicks for this purpose. Such parrots then become quite tame and receptive to learning. A popular pet, the rose-ringed parakeet has been released in a wide range of cities around the world, giving it an environment with few predators where their preferred diet of seeds, nuts, fruits, and berries is available from suburban gardens and bird feeders. Its adaptations to cold winters in the Himalayan foothills allow it to easily withstand European winter conditions. It has established feral populations in a number of European cities, South Africa and Japan. There are also apparently stable populations in the US (Florida, California and Hawaii) and small self-sustaining populations in Ankara (concentrated in parks), Tunis, Tripoli and Tehran (concentrated in the north side of the city). It is also found throughout Lebanon, Israel, the UAE, Bahrain, Qatar, and Oman. A small number of escaped birds are in Australia. A Europe-wide count was held in 2015 and found 85,220 Rose-ringed parakeets in 10 European countries. In the Netherlands, the feral population in the four largest urban areas (Amsterdam, Rotterdam, Utrecht and especially in The Hague) was estimated at 10,000 birds in 2010, almost double the number of birds estimated in 2004. There also exists a feral population in Belgium, with as many as 5,000 pairs estimated in Brussels. These originate from an original population that was set free in 1974 by the owner of the Meli Zoo and Attraction Park near the Atomium who wanted to make Brussels more colourful. In Germany, these birds are found along the Rhine in all major urban areas such as Cologne, Düsseldorf (about 800 birds), Bonn, Ludwigshafen, Heidelberg and Speyer, Wiesbaden and Mainz, and Worms. Other populations are found around Paris, Rome — notably in the gardens of the Palatine Hill, the trees of the Trastevere and Janiculum and at Villa Borghese, in the Orto Botanico di Palermo in Palermo, in Genoa, in Barcelona and in Lisbon. The specimens in these naturalized populations often represent intra-specific hybrids, originally between varying numbers (according to locality) of the subspecies manillensis, borealis[verification needed], and/or (to a lesser extent) krameri along with some inter-specific hybrids with naturalized Psittacula eupatria (Alexandrine parakeet). Where introduced, rose-ringed parakeets may affect native biodiversity and human economy and wellness. In the United Kingdom and especially within London, parakeets face predation by native birds of prey and owls, including the Peregrine falcon (Falco peregrinus), Eurasian hobby (F. subbuteo) and Tawny owl (Strix aluco). There is a feral population of the birds in Japan. In the 1960s many Japanese people became pet owners for the first time and the parakeet was widely imported as a pet. Some escaped or were released and formed populations around the country. By the 1980s groups could be found in Tokyo, Osaka, Nagoya, Niigata and Kyushu. Some groups since died out, but as of 2009 there was a large population residing at the Tokyo Institute of Technology's main campus at Ookayama, along with small groups in Maebashi and Chiba city. ^ a b BirdLife International (2016). "Psittacula krameri". IUCN Red List of Threatened Species. Version 2016.3. International Union for Conservation of Nature. Retrieved 18 June 2018. ^ a b c "How do parakeets survive in the UK?". BBC News Online. Retrieved 14 October 2017. ^ a b Pithon, Josephine; Dytham, Calvin (2001). "Determination of the origin of British feral Rose-ringed Parakeets". British Birds: 74–79. Retrieved 14 October 2017. ^ Morgan, David (1993). "Feral Rose-ringed Parakeets in Britain". British Birds: 561–4. Retrieved 14 October 2017. ^ Jobling, James A (2010). The Helm Dictionary of Scientific Bird Names. London: Christopher Helm. pp. 215, 321. ISBN 978-1-4081-2501-4. ^ Sailaja, R., Kotak, V. C., Sharp, P. J., Schmedemann, R., Haase, E. (1988). Environmental, dietary, and hormonal factors in the regulation of seasonal breeding in free-living female Indian rose-ringed parakeets (Psittacula krameri). Hormones and Behavior 22 (4): 518–527. ^ "Feeding Your Indian Ringneck or Asiatic Parrot". Indianringneck.com. ^ "Indian Ring-Necked Parakeet". Lafeber.com. ^ Krishnaprasadan, T. N., Kotak, V. C., Sharp, P. J., Schmedemann, R., Haase, E. (1988). Environmental and hormonal factors in seasonal breeding in free-living male Indian rose-ringed parakeets (Psittacula krameri). Hormones and Behavior 22 (4): 488–496. ^ Alderton, David (2003). The Ultimate Encyclopedia of Caged and Aviary Birds. London, England: Hermes House. pp. 189–190. ISBN 1-84309-164-X. ^ London Bird Report 2006. London Natural History Society. 2006. p. 93. ISBN 978-0-901009-22-7. ^ "Parakeet 'threat' to native birds". BBC. 22 March 2007. ^ Rosenthal, Elisabeth (13 May 2011). "British Parakeet Boom Is a Mystery, and a Mess". The New York Times. Retrieved 14 May 2011. ^ "Invasive Alien Species in Belgium: Psittacula krameri". ^ Verner, Aldo (17 May 2012). "Pappagalli verdi, ex "prigionieri" che a Genova volano in libertà". Genova.it (in Italian). Retrieved 6 July 2015. ^ Geraldes, Helena (25 December 2011). "Que misteriosas aves verdes e estridentes são estas que invadiram Lisboa". Público. Retrieved 25 December 2011. ^ Ancillotto, Leonardo; Strubbe, Diederik; Menchetti, Mattia; Mori, Emiliano (2015). "An overlooked invader? Ecological niche, invasion success and range dynamics of the Alexandrine parakeet in the invaded range". Biological Invasions. 18 (2): 1–13. doi:10.1007/s10530-015-1032-y. ISSN 1573-1464. ^ Menchetti, Mattia; Mori, Emiliano (2014). "Worldwide impact of alien parrots (Aves Psittaciformes) on native biodiversity and environment: a review". Ethology Ecology & Evolution. 26 (2–3): 172–194. doi:10.1080/03949370.2014.905981. ^ Menchetti, Mattia; Mori, Emiliano; Angelici, Francesco Maria (2016). Effects of the recent world invasion by ring-necked parakeets Psittacula krameri. Springer International Publishin. pp. 253–266. doi:10.1007/978-3-319-22246-2_12. ISBN 978-3-319-22246-2. ^ McCarthy, Michael (8 June 2015). "Nature Studies: London's beautiful parakeets have a new enemy to deal with". The Independent. The Independent. Retrieved 20 December 2017. Wikimedia Commons has media related to Psittacula krameri. This page was last edited on 12 April 2019, at 01:22 (UTC).